The new members of the PSC with President David Granger. From L-R: Vincent Bowman, Michael Somersall, Chairman, Geeta Chandan-Edmond, President Granger, Mavis Benn, Maurice Gajadhar and Mortimer Livan. 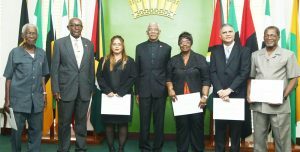 The six-member Public Service Commission (PSC) was sworn-in yesterday for a three-year stint by President David Granger at State House. After the swearing-in they met to elect Special Prosecutor Michael Somersall as Chairman. The other members who took the oath to serve included Mavis Benn, who was elected Vice-Chair, Vincent Bowman, Geeta Chandan-Edmond, Maurice Gajadhar and Mortimer Livan. Somersall, a former Assistant Commissioner of Police, is one of the five special prosecutors being paid by the state under the current Government to pursue fraud charges against officials in the former People’s Progressive Party administration. Following the ceremony, Somersall indicated that he did not believe that there would be conflict of interest if he decides to continue in both roles. However, he said that with the new appointment, he will have to give up some time performing the functions of state prosecutor. During the ceremony, President Granger reaffirmed the administration’s respect for the independence of the PSC. He noted that the swearing-in of the Public Service Appellate Tribunal last year and the Public Service Commission this year is evidence of the Government’s determination to establish and maintain a professional Public Service. “The Public Service Commission promotes a professional Public Service by ensuring that its appointments are based on the principle of merit rather than political patronage and that disciplinary action and removals, when necessary, are just. The Commission can enhance the professionalism of the Public Service by appointing public servants who evince the qualities of impartiality, integrity and intelligence,” President Granger said. Further, the President stated that Citizens’ access to public services – such as public education, public health, public infrastructure, public security, public telecommunications and social protection, for example – requires the existence of an impartial Public Service. He stated such a service would be committed to implementing the policies and programmes of the Executive and to ensuring that the delivery of services to all Guyanese continues regardless of the political party in office. The President noted that Guyana’s development demands a proficient, professional Public Service and public servants are essential to the country’s administration since they exert direct and daily influence on the lives of Guyanese through various official agencies, boards, commissions, departments and ministries. “The Public Service serves the public good. It ensures the efficiency and efficacy of the delivery of public services. Public servants are responsible for advising and assisting ministers of the Government; implementing government programmes and projects; delivering public services and executing public policy intended for the benefit of the people,” President Granger noted. Permanent Secretary of the Ministry of the Presidency’s Department of the Public Service (DPS), Mr. Reginald Brotherson stated that the new Commission has a number of matters to deal with. Some of these will include appointments.